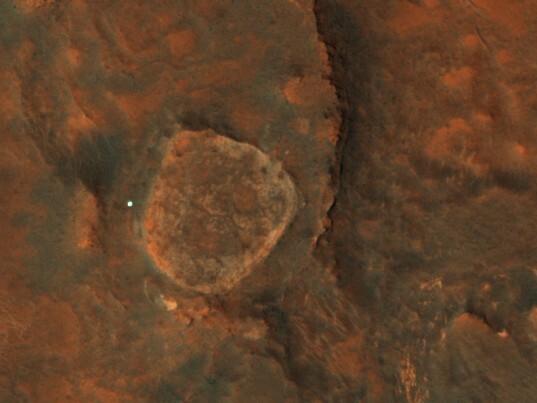 When HiRISE took a photo of Spirit's resting spot in Gusev crater on March 31, 2011, it happened to be in exactly the right position to catch a specular reflection (a glint) from the rover's solar panels. Apart from being pretty, it signifies that there was not a thick coating of dust on the panels. Spirit's position is very clearly marked by a brilliant white dot. Anyone who's ever learned to use a signaling mirror should understand the physics at work here: the Sun was in exactly the right position so that it glinted off of Spirit's solar panels to the HiRISE camera. (In other words, Spirit's solar panels are acting like a mirror, and when HiRISE took the photo, it was in just the right position so that it happened to "see" the Sun in the solar panel mirror.) This was fortuitous and unplanned, and happened at a fitting time, almost exactly a year since her last communication with Earth, when hope was waning for us to hear from her again. Ground-based measurements prior to launch showed that the specular reflection could be seen even when there is a thin dust cover over the panels. This result does show that the solar panels are not covered by an optically thick layer of dust (i.e., too thick for any light to pass through it). There are many possible reasons that Spirit is not communicating with Earth, but this image would seem to rule out the possible problem of insufficient sunlight reaching the solar panels.